COLUMBIA - The Food Bank of Central and Northeast Missouri moved to a new location to help feed more people in the community. The food bank did research and discovered most of the people who use the mobile food pantry are in the northwest part of town, where it previously didn't stop. One resident of Columbia, Nygia, said relocating the pantry helped her out and others who don’t live close to the food bank. “Everyone doesn’t have access to the outskirts of town, and the public transportation isn’t as reliable enough to get you where you need to go and occasionally a cab can cost 40 bucks,” she said. Director of programs for the food bank, Eric Maly, said 13 mobile food pantries visit 15 locations monthly and it goes as far as to Rolla. “One of the major barriers for people to get assistance is transportation, and so we utilize mobile pantries to bring enrichment to families and that way once a month they have a way to get more fresh fruits and vegetables,” he said. Nygia said not too many people know about this resource and having it in a more central location can get the word out to more people. “This took a lot of people by surprise because they didn’t know about this. It lets people know more about what is available out there for its resources, and it's not something that is counted as your monthly visits to the Central Food Bank,” she said. Maly said the food bank enjoys helping the community; however, being able to help more people not need the assistance is the goal. One the fourth Wednesday of the month from 4p.m. 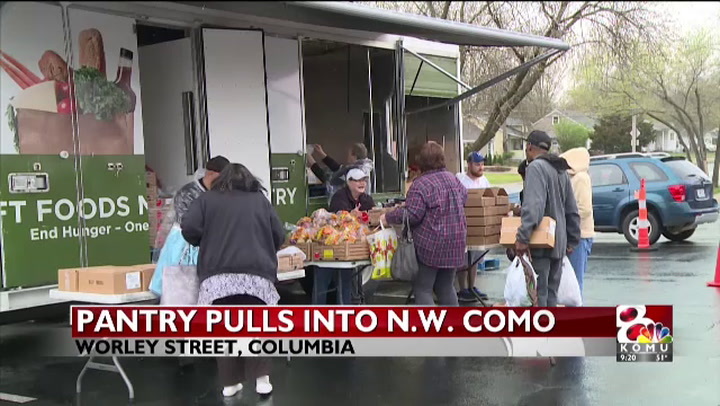 to 6p.m., the mobile pantry will come to 1005 W. Worley St. to serve the community. “Ultimately, we’d love to see the need go away and shorten the line than see a long line,” Maly said.